Whether you're enjoying a warm wintery beverage or something cool and refreshing, coasters are always useful. And when you make them by hand and add some embroidery, they become extra special. These stitched felt coasters come together quickly and make a great last-minute gift for a friend (or yourself). Any small embroidery pattern will work with this project, so you can choose something that suits your style. The snowflake mug in the sample is from the free Holiday Minis pattern set. Simple snowflakes would be another good option for winter coasters, or you might make them with an embellished monogram. It's usually easiest to plan ahead and work the embroidery specifically to fit a project like this. However, if you like stitching small designs, there's a chance you already have the embroidery all ready to start making your first coaster. Gather your supplies and get ready to make a set of stitched coasters. For each coaster, cut two 4-inch squares of felt. Cut one 3.5-inch square of fusible batting. Cut the completed embroidery into a 3.5-inch square with the embroidery centered in the square. If you're using regular batting and fusible web, cut 3.5-inch squares of each of these. To make the cut-out portion of the front piece of felt, remove the inner ring of a 3-inch embroidery hoop. If you don't have one handy, find an object of a similar size to use as a template. Center the hoop ring on one of the felt squares and trace the inside of the ring. This will give you a circle that's about 2.75in. Fold the felt to start cutting, then cut out the circle. Following the manufacturer's instructions, fuse the batting to the back of the embroidered square. If you're using plain batting and fusible web, sandwich the web between the embroidery and batting and fuse the layers. Use care when ironing the embroidery. Place the embroidered piece (with batting) in the center of the solid felt square. Run a thin line of fabric glue around the ​circular opening on the back of the front felt piece. Carefully place the glued felt down around the embroidery, making sure that it doesn't touch the fabric until it's in the right place. Use the back felt piece as a guide for placement. Gently press the felt down so it adheres to the fabric and let the glue set up for about 15 minutes (or longer if the glue you are using sets up slower). Pin the layers together so they don't shift. Stitch around the edge of the coaster with three strands of either matching or coordinating embroidery floss. Use a running stitch, blanket stitch or another favorite that will hold the layers in place. Be sure to hide the starting and ending knots between the layers of felt. Remove the pins as you make your way around the edges so the thread doesn't continue to catch on the pins. Once you've made one coaster, it's time to make enough for a set. Each coaster can be the same or choose a group of motifs to make a set. The felt doesn't even need to be the same color for each. You might want a rainbow of coasters. Giving a set of coasters as a gift? Pair them with some mugs or a bag of coffee. 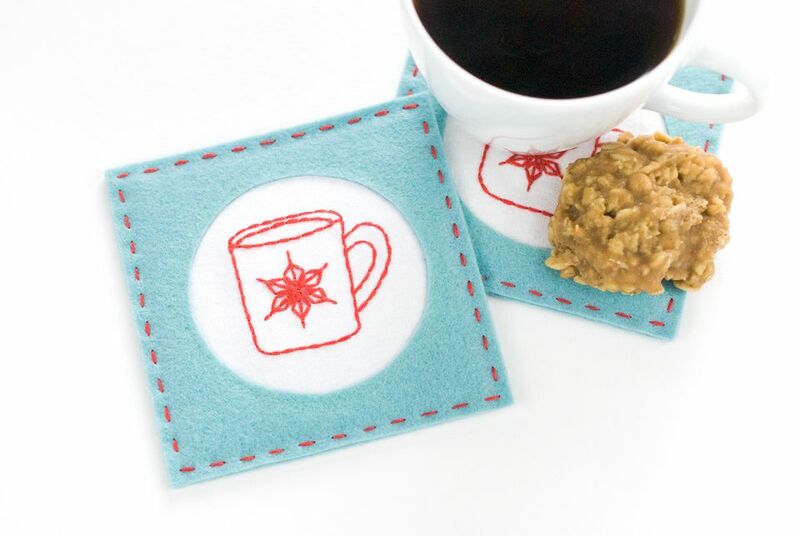 If a coaster is a little small for your mug and a sweet snack, try altering the size to make a mug rug or a trivet.